Every year, around 1 in 10 babies worldwide are born prematurely. This equates to around 15 million babies and their parents having to spend time in Neonatal Intensive Care Units (NICU) in incubators. Despite improvements in neonatal care, approximately 1 million of those prematurely born babies will not survive. Of those who do survive, many suffer complications including learning disabilities, visual and hearing problems which affect their whole lives. A major problem associated with premature birth is lung immaturity – the babies are simply not ready to breathe yet. In the womb, babies receive their oxygen through their mother’s placenta via their umbilical cord. This means that premature babies do not have a fully functional ability to use their lungs. Current therapies used to treat this in the NICU includes mechanical ventilation and additional oxygen. Whilst this often helps, unfortunately it can also be detrimental over the entire lifetime of the infant as their lungs will have developed differently than if they had been born full-term. Is there an alternative to incubators in the NICU? This possibility has been explored before, with attempts to develop an artificial womb being investigated since the 1950’s. Unfortunately, none of these systems have succeeded before. Now, a team from The Children’s Hospital of Philadelphia have spent four years developing an artificial womb, or ‘extra-uterine’ system which appears as though it might revolutionize neonatal care. The Biobag consists of a sealed bag, fluids and gas exchange mechanisms. The sterile bag is filled with a solution of electrolytes, which acts as an artificial amniotic fluid. The fetus is then placed within this bag before it is sealed closed. A pump is used to refresh and replace the artificial amniotic fluid periodically, just like in humans and other mammals. The bag is placed on a heat plate which keeps the temperature within the bag constant. One of the revolutionary aspects of this system is that it does not contain a pump for the circulatory system. Instead, the flow of blood is driven by the fetus itself. 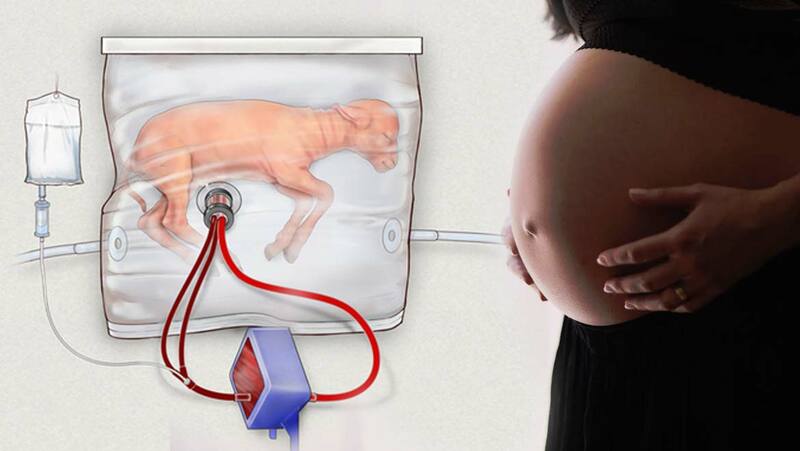 The fetus’ heart pumps the blood to a gas exchange machine via the umbilical cord. The blood passes out of the fetus, through the umbilical cord, passes through the oxygenator and then back to the fetus. The oxygenator allows for the removal of carbon dioxide and addition of oxygen and is designed to mimic normal physiology as closely as possible. The artificial amniotic fluid is made by adding a variety of different salts to water. This fluid allows for correct lung development as well as recreating the supportive and swaddling environment of the womb as closely as possible. So far, the team have used a lamb animal model, due to the fact that the majority of our knowledge regarding fetal development, circulation and growth has been gained through the study of lamb fetuses. The Biobag allowed for a fetus to be supported for up to four weeks, which is far more than ever achieved in previous research. The lambs showed normal maturation and development throughout the time they were in the Biobag. During the initial years of research, the team did not have access to a great deal of funding. So in order to design their prototypes, they used supplies from plumbing stores and beer making kits. This prototype convinced the team of the possibility for further research. The results of this study definitely support translating this system into clinical therapy for human babies. Potentially, it could look similar to a traditional incubator but with the baby supported in fluid. The majority of pregnancies at risk of extreme immaturity could benefit from the Biobag. If babies born prematurely around week 23 to 24 of pregnancy could be supported on this system then their normal physiologic development would be allowed to continue, having a huge impact on their ongoing health. This research does bring up some moral questions over the potential use of the Biobag. The researchers are very clear that the intention has never been to support a premature baby on this system until the standard full-term of 40 weeks. Instead, the plan is to bridge those early weeks until the baby is stronger. Each week morbidity and mortality decrease, so by 27 weeks most of the risk associated with prematurity is reduced. It is envisaged that at this point the baby could be safely transferred to an incubator. Whilst the research so far is not directly comparable to humans, it is hoped that the use of the device can be extended to premature human babies in three to five years. The possibility of a new and improved way to care for premature infants would be a fantastic advance for neonatal medicine. If the Biobag can support them through those first crucial few weeks, then this amazing team of scientists will have reached their goal.